The olive tree is known for thousands of years and has been a symbol of culture and honor in Greece. Our farm, at Paralion Astros, a seaside village 4 kms away from Astros, has been planted with olive trees (the most famous in the world Kalamata variety and the special Blonde Kynouria variety) since 1954. The mild Mediterranean climate with long periods of sunshine becomes ideal for agriculture and especially olive growing. Last two decades, we also have been formally grown up in the market of packing finest edible olives (Kalamata variety and Blonde Kynouria variety), taking advantage of 60 years cultivating experience at our own farm. 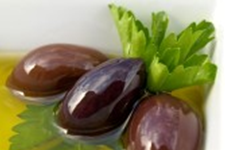 Kalamata olive is the ultimate olive! Natural, purple black, powerful and juicy! Imported from sun-drenched Greece. It often known as the Greek olives. They are collected by hand when naturally ripened, one by one, they are washed and brined patiently without artificial ingredients. It is popular for its nutritional properties and its high value in contemporary diet. It has distinctive taste and appearance, with oval shape, dark purple color, big size, intense flavor and fleshy texture. Often used as a table olive. We offer Kalamata variety olives as well as Blonde Kynouria variety olives packed in brine with different sizes and packages. We pack them using pasteurization, through state of the art technology answering all the safety and hygiene requirements of today. We would like to clarify that when we talk about Kalamata variety olives, we exclusively talk about the original, traditional Kalamata variety olives not the type of Kalamata nor any other olive variety which may look like Kalamata variety olives. To exceed our customers’ expectations in quality, delivery, and price through continuous improvement and customers interaction. We believe that business can only survive and prosper if it wins the confidence and satisfaction of the customers.